Does Microsoft's Windows Phone 7 have what it takes to compete against Apple's blockbuster iPhone and the Android army? We'll find out October 11 when Microsoft officially pulls back the curtain on its smartphone at an event titled Windows Phone 7 Worldwide Launch Event taking place in New York City. All eyes will be on Microsoft to deliver an impressive offering in the wake of the company's last attempt at the mobile market, which was a miserable failure. In June Microsoft discontinued its Kin line of smartphones just six weeks after it launched. Since then, Microsoft has reassured its partners and developers that it will deliver a compelling smartphone to compete in the burgeoning market. Still, many questions are still unanswered about the new smartphone platform. Which carriers will Microsoft anoint at launch? How many device models will be available before the end of the year and who are the manufacturers at launch? What will Phone 7's third-party app catalog be like at launch? And, most importantly, how much will the devices cost and when will they be available? With so many questions still needing answers here's what we know so far about Microsoft's Windows Phone 7 launch. One rumor that has been floating around for some time is that Windows Phone 7 devices will only be available on GSM networks at launch. CDMA networks, such as Verizon and Sprint, will reportedly start offering Phone 7 devices in 2011. Recently, The Wall Street Journal reported that AT&T would be the exclusive Phone 7 provider at launch. Microsoft, however, appears to be throwing cold water on that rumor. The company's press invitation states that reporters in attendance will get "an exclusive showing of T-Mobile powered Windows Phone 7 devices." So we know that T-Mobile will be present and that the company will be showing off Phone 7 devices for their network. Does that mean T-Mobile will offer Phone 7 devices at launch? Probably, but it's also possible that T-Mobile is being given the limelight over AT&T because its devices would not be available until after the AT&T debut. That seems unlikely, but you never know. 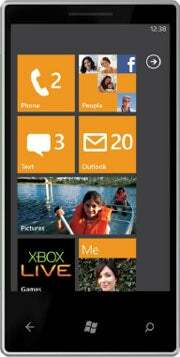 Numerous leaked photos and specifications of purported Windows Phone 7 devices have surfaced online in recent months. HTC is said to be working on at least one handset called the HTC Mondrian. The blog WMPowerUser posted an AT&T-branded commercial to YouTube showing off the handset--Microsoft has since asked YouTube to take the ad spots down. Specs for the Mondrian are scarce, but the device will reportedly be a modification of the Windows Mobile 6.5-based HTC HD2 with a 1.3GHz Snapdragon processor. Images of another HTC device leaked online in July, and recent statements by an HTC executive based in the Middle East suggest the company could release several Windows Phone 7 devices before the end of the year. Dell is reportedly working on a Windows Phone 7 device called the Lightning, according to Engadget. The handset is rumored to be sporting a 4.1-inch WVGA OLED screen, 5-megapixel camera, 1GHz Snapdragon processor, SD card slot with an 8GB card pre-installed, GPS, accelerometer, digital compass and FM radio. The Lightning will reportedly be a GSM device at launch. The blog Pocketnow obtained images of a Windows Phone 7 device purportedly made by ASUS. There were no specs for the device, but the ASUS handset bore a striking resemblance to a device Microsoft was showing off during the Gnomedex conference in September. LG is also working on a device with a slide-out keyboard called the Panther, according to Pocket-lint. There are no specs for the device, but LG has been showing off the device to journalists since February. Samsung in late September announced it had licensed Windows Phone 7, and will have several devices ready to launch in the coming months, according to Gizmodo. All Phone 7 devices have to meet certain minimum requirements including at least 256MB RAM, 1GHz processor 4GB of flash memory storage, Wi-Fi (b/g) support, capacitive touchscreens and GPS, accelerometer, compass, proximity and light sensors. The key to Windows Phone 7's app catalog may not be to have hundreds of thousands of third-party apps like Apple's iTunes Store does. Or the tens of thousands in the Android Market. Instead, it may be important for Windows Phone 7 to make sure they have the more popular apps at launch. Apps such as Facebook, Twitter, Netflix, Evernote, and Dropbox. Microsoft will be featuring several apps during its launch event on October 11, but some app developers have already been showing off their work. During Microsoft's MIX 10 event in March Windows Phone 7 apps debuted from the Associated Press, Netflix, comic book viewer Graphic.ly, Shazam, Foursquare and Major League Soccer. Technologizer recently wrote about forthcoming apps from Ustream, Flixster, and mobile feed reader YomoMedia. Other forthcoming apps include Twitter, Travelocity, and YouTube, according to TechFlash. Xbox integration will also be a huge part of Windows Phone 7. PCWorld's Matt Peckham recently reported that Microsoft already has about 60 games lined up for Windows Phone 7 such as Assassin's Creed, Bejeweled LIVE, Castlevania, Crackdown 2: Project Sunburst, Frogger, Guitar Hero 5, Halo Waypoint, Splinter Cell Conviction, Star Wars: Conviction, and Zombie Attack. It's not yet clear when Windows Phone 7 devices will be available for purchase, but the week of November 8 is the expected launch window. There is no word on pricing for any of the devices.